For inner tube beginners and the most seasoned of open water veterans, there is something so appealing about the humorous, safe, unique ride delivered by the classic inflatable hot dog inner tube. Airhead has hot dogs of several sizes, and the Jumbo Dog that seats up to five people is the largest in the selection. The Airhead Jumbo Dog features ample space and accommodations for each rider. From front to back, each passenger will enjoy a large nylon-wrapped handle with neoprene knuckle guards, as well as large neoprene seat pads for comfort and stability. From front to back, the Jumbo Dog measures twelve and a half feet long and forty-four inches wide. Rope hookup is made super easy with the Airhead trademark Kwik-Connect. The hot dog inflatable is made of three 30-gauge vinyl air chambers that are fully protected and encased by a double stitched 1,680-denier nylon cover. 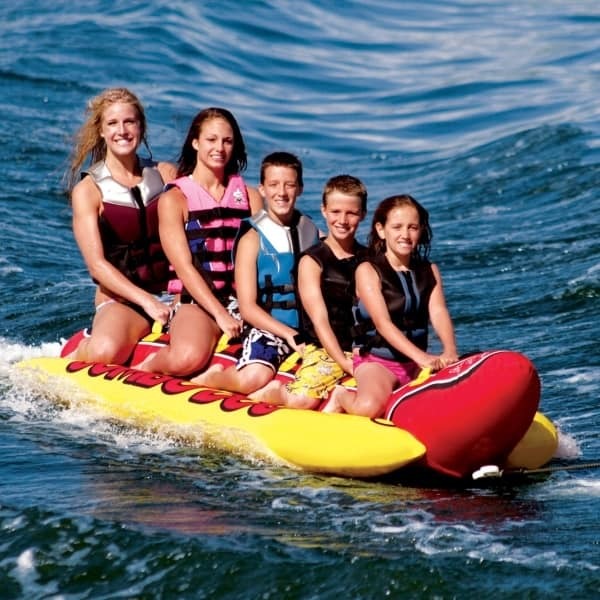 Enjoy the laughter, excitement and enjoyment that the Jumbo Dog can deliver you and yours on the open water.